Just getting one last quick post in before it's CHRISTMAS!!! Here's one of my favourite lip colours/combinations for around this time of the year, using one of the best lip shades from the Motives for LaLa lipstick collection (in my opinion!) to demonstrate. You can never go wrong with a rich berry/wine shade during the holidays. This lipstick is very creamy to begin with and already has a nice sheen to it, but if you're more of a lipgloss girl, it looks equally lush with a gloss placed over the top. 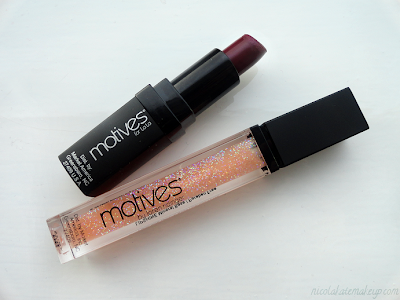 Staying true to my current glitter obsession, I added a gloss that has very pretty glitter particles in it. Wishing everybody a very merry Christmas, and I hope everybody has an awesome time!